Hospitalist groups have been among the highest volume participants in Medicare’s Bundled Payments for Care Improvement (BPCI) demonstration project, initiating almost 200,000 episodes representing over $4.7B in spending since the model began1. On January 9, the Centers for Medicare and Medicaid Services (CMS) announced BPCI’s follow-on model, ‘BPCI Advanced’,2 which starts in October of this year and is slated to finish at year-end 2023. CMS intends for the program to qualify as an Advanced Alternative Payment Model (APM). 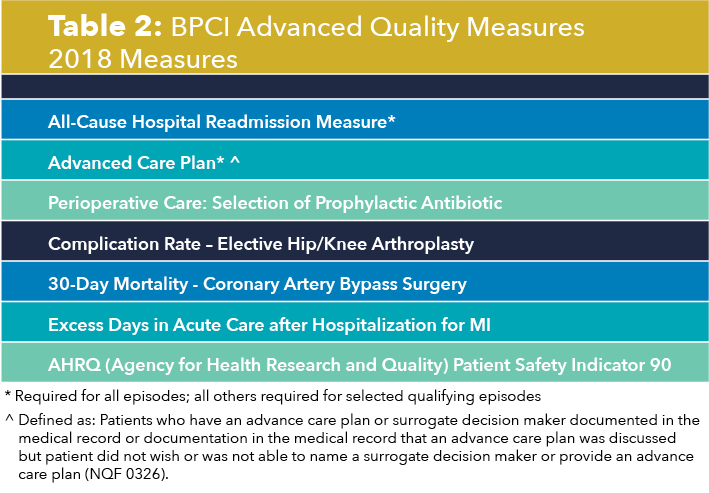 As BPCI Advanced focuses on 29 common medical and surgical episodes involving an inpatient stay (it also includes three outpatient episodes) and the subsequent 90 day recovery period, it represents the first large scale opportunity for hospitalists to meet criteria for Advanced APM participation. Qualifying for the Advanced APM track of the Quality Payment Program – which involves meeting patient volume or payment thresholds3 – comes with a 5% lump sum bonus based on Medicare Part B fees and avoids exposure to penalties and reporting requirements of the Merit-based Incentive Payment System (MIPS). Meeting the volume or payment thresholds, however, may be challenging for hospitalist groups, since for 2019 a group must have 50% of its Medicare Part B payments or 35% Medicare Part B patients in an Advanced APM. Still, even if thresholds are not met, participation is likely preferable to the alternative MIPS track, as the former will have less burdensome reporting requirements, will prepare the group for value-based payments, and will be a new revenue opportunity (with risk) through program savings. 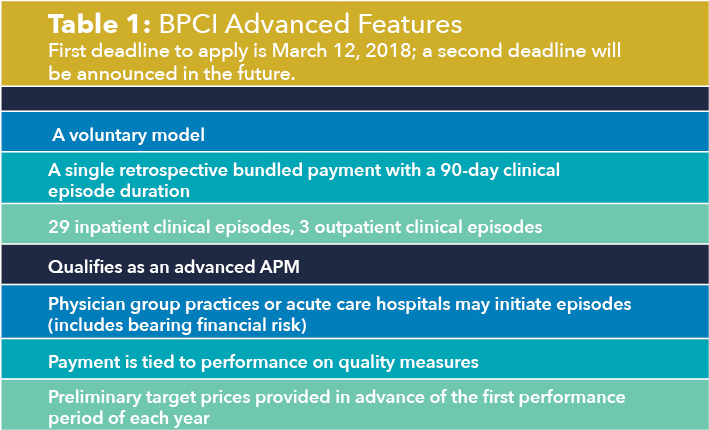 Acute care hospitals and physician groups may initiate episodes under BPCI Advanced, assuming financial risk under the model. Similar to its predecessor, BPCI Advanced assigns a target price based on past claims payments associated with the ‘episode initiator’. During the performance period, if the initiator can beat the price in the aggregate for its bundles, it can keep the difference, and if it comes in over the price, it must pay the difference back to Medicare. Medicare discounts the target price by 3%, effectively paying itself that amount. After that, there is no sharing of savings with Medicare, in distinction to the permanent ACO programs, where there is sharing after the ACO meets the minimum savings rate. The program allows physician groups and hospital initiators to go it alone or to work with a ‘convener’, which may share risk and reward with initiators, and may provide software, analytics, networks of high performing providers like nursing facilities, and knowledge of specific care redesign approaches to enable program success. See the Table 1 for a listing of other notable features of BPCI Advanced. BPCI Advanced qualifies as an Advanced APM in part because payment is tied to performance on a set of quality measures (see Table 2). There are two measures applied to all episodes: all-cause hospital readmissions and advance care plan4. These are notable because hospitalists may be especially focused on improvement activities in these areas. While the advance care plan measure refers to a process reflected by record documentation and is therefore directly under the control of hospitalists, readmissions – and most of the other measures – require a team approach. 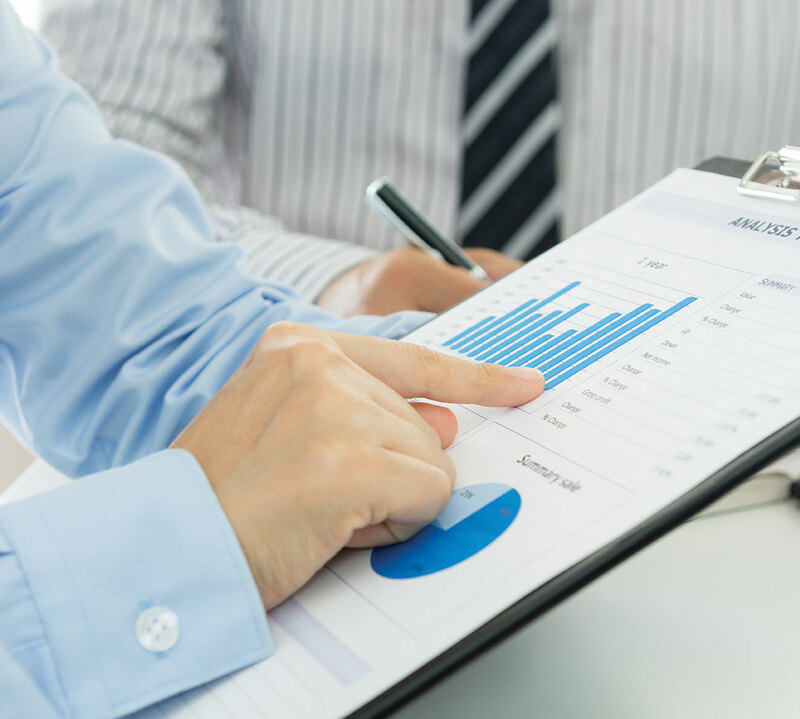 Because the outcome measures are risk adjusted, accurate and complete clinical documentation is crucial, as it drives how risk is adjusted. Of note, all the 2018 measures, collected directly through claims, will place no additional administrative burden for collection on doctors or hospitals. Hospitalist groups – whether independent or employed – may be episode initiators in BPCI Advanced. In this case, any episodes in which the group participates that carry the name of a member of the hospitalist group in the ‘Attending Provider’ field on the hospital bill claim form to Medicare (and the associated carrier claim) are attributed to that member’s physician group. This means that the group is responsible for payments represented by Medicare Part A and Part B claims (with a few exclusions like trauma and cancer) against the target price for the initial hospitalization and subsequent 90-day period. In practice, hospitalists are rewarded for actions aimed at improving functional status, avoiding complications and harm events, optimizing location after discharge5, avoiding readmissions, choosing efficient nursing facilities, and providing appropriate care to those with life limiting illness. The other way hospitalists may participate is through an agreement to share in savings with a hospital or physician group episode initiator. This requires hospitalists to enter into a contract with the initiator that meets certain program requirements – e.g., report quality measures, engage in care redesign, use certified EHR technology (note: hospital-based clinicians automatically fulfill this criterion). BPCI Advanced may represent a key milestone for hospital medicine, if it creates the opportunity to fulfill the longstanding aspiration for hospitalists to be paid for the value they confer to the broader system instead of simply their professional billings. While there are legitimate concerns about the effect MIPS may have on healthcare value and the complexity of participation in advanced APMs, barring a repeal of the law that created them, hospitalists now have the chance to extend their influence within and outside the hospital’s four walls and be more fairly rewarded for it. Note: The author’s employer, Remedy Partners, is an Awardee Convener for the BPCI initiative and intends to apply as a Convener for BPCI Advanced. Defined as: Patients who have an advance care planor surrogate decision maker documented in the medical record or documentation in the medical record that an advance care plan was discussed but patient did not wish or was not able to name a surrogate decision maker or provide an advance care plan (NQF #0326). Whitcomb W. Choosing location after discharge wisely. the-hospitalist.org. January 3, 2018. Digital edition. Accessed January 13, 2018.